We have three videos from the concert Carol mounted at the Barn Theatre, Seaford. The default above shows Carol in stylish cabaret mode. Click the links below to choose between this and two pieces in a more classical vein. Carol wanted people to buy an album of the event, and by doing so to donate to her favourite charities. The video compilation is now ready, and is available as a DVD. There's also an audio CD of the songs. Click here to order. The quality of the Youtube videos above isn't bad, but on the DVD it is much better. ... also songs by Britten, Poulenc and Sondheim; an extended cabaret/song-and-dance section with songs by Cole Porter and Jerome Kern; two very different kinds of song written specially for Carol; and a surprising pop song. For more information about who sang what at the concert, please click here to see a full playlist. 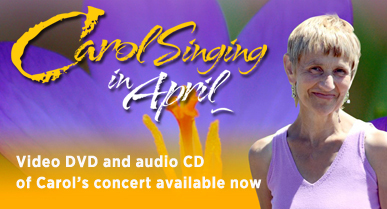 Video and audio recordings of Carol Singing in April are now ready, and you can order a DVD and/or CD online through this web site. The proceeds will go to charity. Click here to go to the ordering page. Carol Singing in April was the concert Carol mounted at the Barn Theatre, Seaford on 19 April 2014. It was a celebration of the music she loved, and an opportunity for her to demonstrate her ability to deliver it with style and impact. Friends from across the musical spectrum helped her make it a resounding success, and a truly memorable occasion. Carol was a talented mezzo soprano who worked in Britain and abroad for more than thirty years, but died prematurely of cancer in June 2014, not long after her Carol Singing concert. Most of her work was in opera, but she was also an accomplished cabaret singer. Carol will be remembered for her warm, positive personality; her sense of humour; her brisk, down-to-earth take on life; her highly professional approach to her work; and her extraordinary gifts as a singer in many different styles. We have updated this site to include sections on Carol's drawing and writing activities, and we will continue to add more music extracts and other material when the opportunity arises.